Crew Sergeant/Section Chief + .30 cal M1 Rifle. Pvt/Gunner + .30 cal M1 Carbine. Pvt/Gun Layer + .30 cal M1 Carbine. 4 x Pvts/Cannoneers + .30 cal M1 Carbines. Corporal/Ammunition + .30 cal M1 Carbine. 2 x Pvt/Drivers (Towing Vehicles) + .30 cal M1 Rifles w/M7 Grenade Launchers. Round Weight HE (M101) 42.96 kg. Smoke (WP M104) 44.53 kg. Bagged Charges: 4.69 kg & 9.23 kg. Muzzle Velocity HE 853 m/s. 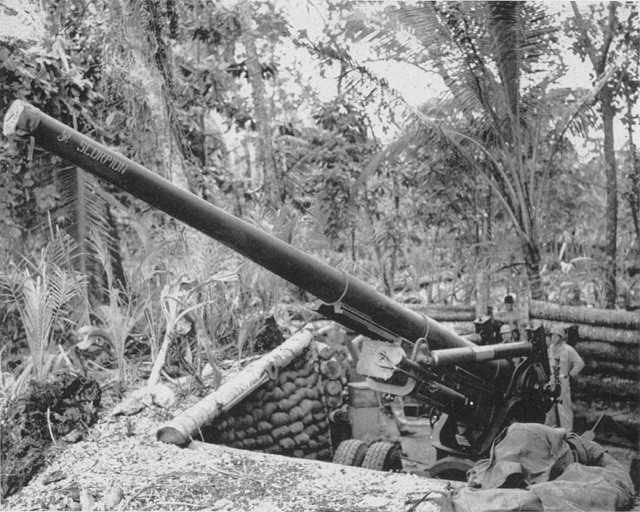 Notes M1A1 155mm Gun The US army had planned to replace the old GPF design in the 1920s but due to lack of funds the venture was shelved. In the 1930s the army wanted to extend the range of their heavy guns and a range of 25.000 yards (22.000m) was the target. The new design used a similar barrel to the GPF but had a different breech, the carriage was the M1 and had a split trail with eight wheels. Designated as the M1 it was developed along with a new 8in howitzer and both weapons were identical apart from the barrel. The M1 gun was quickly replaced by the improved M1A1, this had a few modifications made to the breech ring. The M1A1 “Long Tom” became the standard Corps Gun both the Army and Marines and remained virtually unchanged except for the M2 having a simpler breech ring installed. It went on to serve well after WW2 as the M59 Gun.